Is Your Child’s Backpack a Health Hazard? As practical as backpacks are, as indispensable as they are to today’s educational experience, they can also be health hazards and cause serious chiropractic injury that can linger for decades. Every year, nearly 14,000 children are treated for neck, back and shoulder pain related to backpacks—more than a third of them in emergency rooms. And no wonder: each item typically stashed into a backpack—lunch, textbooks, binders, school supplies—weighs an average of 3.5 pounds. Do the math and compare the total as a ratio to your child’s weight, and you begin to appreciate the problem. Alter posture sufficiently to result in lower and mid-back pain and muscle tightness. 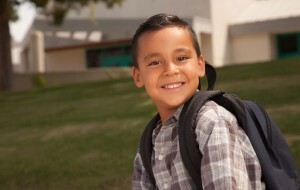 Make sure that the loaded backpack weighs no more than 10-15% of your child’s total weight.